In 2003, Twin brought together a global network of nut producers to increase smallholder market access by developing the first ever Fairtrade standards for nuts. Fairtrade helped to boost sales, but to achieve a seismic shift in the market we went back to the producers to discuss setting up a game changing nut company. In 2007, Liberation Foods, the world’s first farmer-owned ethical nut business, was launched by the International Nut Cooperative (INC), Twin and Equal Exchange UK, with support from Comic Relief, Cordaid and The Hunter Foundation. INC cooperative members representing 22,000 farmers across Asia, Africa and Central America own a 43% share in Liberation, Twin owns a 23% share and the remaining shares are held by Cordaid, Equal Exchange in the UK and USA, and other ethical investors. Twin also sits on Liberation’s Board alongside two producer representatives elected by the INC to guide the company’s strategic decision-making. Producers not only enjoy better market access through Liberation, they gain valuable market insight and have a platform to share their stories. Since its first year of operation, Liberation has supplied the majority of UK supermarket private label Fairtrade nuts, launching into mainstream markets with Tesco, closely followed by Sainsbury’s. Liberation’s award-winning branded products are also available in Waitrose, Traidcraft, Oxfam and independent outlets. As Europe’s largest supplier of Fairtrade nuts, the company is at the forefront of creating a new market segment for ethical nuts and is supported by a host of celebrity ambassadors, including comedian Harry Hill and celebrity chefs Allegra MceEedy, Hugh Fearnley Whittingstall, Antony Worrall Thompson and Gary Rhodes. In addition to trading nuts and developing new value chains in partnership with Liberation, we also collaborate to support smallholder suppliers within key value chains. 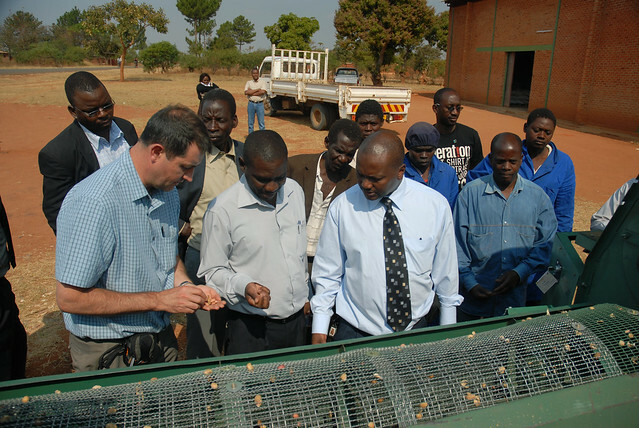 Our main area of work is in Malawi, where we have been working with Liberation and producer association NASFAM to reinvigorate the export market for groundnuts. Nut exports from Africa have declined significantly due to strict controls on the contaminant aflatoxin. A key focus of our work is therefore on improving quality management practices. Gender justice: training farmer leaders to become gender champions and mainstreaming gender across all training. As labour intensive nut processing is considered ‘woman’s work,’ we use the Gender Action Learning System (GALS) methodology at the household and organisational level to ensure women are recognised and fairly rewarded. Sustainable agriculture: trainings on good agricultural practices, including land use and preparation, planting varietals, and sustainably increasing yields. We also promote water conservation as climate change associated erratic rainfall is increasing causing water stress. Business Management: work with groundnut associations to make buying systems more effective, efficient, and traceable. We also support extension services provided by cooperatives, improving the design, implementation and monitoring of training and producing a good practice handbook. Quality: working with Liberation’s Technical Manager to improve Quality Management practices and meet EU export requirements on aflatoxin. "Twin continues to be a true Fair Trade pioneer with an absolute commitment to smallholder farming organisations in some of the most challenging regions of the world. To us at Liberation, that means we can do what many said was impossible: source high-quality nuts from a collective of small scale farmers in Africa, Latin America and India."